For you to be successful at work, you need to know how to think like a designer when approaching an engineering task, especially when working within a team or leading a team. By applying a design-centered approach you’ll be able to conceive of radically innovative solutions, deeply understand who your real stakeholders are and what they care about, create vision that gets buy-in from senior management and colleagues, avoid hazards, and create solutions that people love both emotionally and intellectually. Using a 10-step design process and a 3-step vision creation and communication process, you’ll experience the design process first hand in this interactive class that will expand your thinking and help you and your teams create more powerful solutions. You’ll learn how to create materials that align technical and non-technical audiences, understand the vital importance of the psychology behind how people interact with technology, how to manage creativity, and how to assess the effectiveness of your solutions. In this era of rapid advances in automation, Machine Learning and Artificial Intelligence, a focus on ethics is essential. The decisions we make while developing everything from self-driving cars to robot helpers, or gathering data for geo-location or social media, can have wide-reaching impact on many aspects of society. We must consider situations we’ve never had to address as well as the most ethical ways to address them. Mastering Innovation & Design-Thinking may be taken individually or as a core course for the Professional Certificate Program in Innovation and Technology. This course is targeted for design engineers, research engineers, project engineers or managers, product engineers, members of the technical staff, applied scientists, and research scientists. Professionals in other areas who believe that design-thinking would be valuable in their careers are also welcome to attend. The course may also be of interest to those who supervise early-career professionals and those in academia (e.g. engineering and science graduate students, and post-docs). Due to the broad nature of the material and the broad nature of design-thinking, professionals at various levels in their career may find the tools and techniques taught in this course valuable. Laptops or tablets with the ability to create PowerPoint or Keynote presentations are required for this course. Class runs from 9:00 am - 5:00 pm each day. 5:00 pm - 10:00 pm – Optional group activity, Monday only. Tuesday evening is open. "Never took such a dynamic course like this." "This class is very dynamic. It's easy to stay connected to the class, even after almost 10 hours of class. The teacher provides a lot of examples from his own experience and demonstrates high knowledge about the topic. In addition, they [are] successful leaders and an inspiration." "Everything exceeded my expectations. The organization was brilliant and the content was very deep ..."
SPECIAL PROJECTS MANAGER, NUEVATEL PCS DE BOLIVIA S.A.
"MIT Professional Education courses are the best in its class." "The instructors provided us relevant practical assignments while they were teaching the theory. This helped me a lot to learn completely while in the class." Blade Kotelly is a senior lecturer at the Bernard M. Gordon-MIT Engineering Leadership Program. For over a decade, Blade has taught courses on design thinking, first at Tufts University and now at MIT as part of the Bernard M. Gordon-MIT Engineering Leadership Program, where he's been teaching for the past four years. He is a frequent guest lecturer at Stanford University and Harvard University and holds a B.S. in Human-Factors Engineering from Tufts University and an M.S. in Engineering and Management from MIT. In addition to being a Senior Lecturer at MIT, Kotelly is the Head of Experience Strategy at Sonos. Prior to that he was the VP of Design at Jibo creating the worlds first social robot, the Chief Designer at Rapid7 a leader in IT security software, and the CEO and founder of StorytellingMachines a Cambridge MA-based software firm enabling everyone make short, high-impact movies. Kotelly has worked on the design of a variety of products for the Fortune 500, including search and information access systems, the first clam-shell pagers for Motorola, and hundreds of speech-recognition systems and websites for companies including Apple, FedEx, United Airlines and others. He wrote the book on speech-recognition interface design The Art and Business of Speech Recognition: Creating the Noble Voice (Addison Wesley, 2003), and his work and thoughts have been featured in publications including The New York Times, the Wall Street Journal, and on media including TechTV, NPR, and the BBC. Dr. Reza Rahaman, Industry Co-Director and Senior Lecturer. Dr. Rahaman returned to MIT in 2018 after a 29 year career in the Consumer Packaged Goods, Pharmaceuticals, and Agricultural Chemical Industries. Immediately prior to MIT, Reza was the Vice-president of Research, Development, and Innovation for the Specialty Division of the Clorox Company. In that role he was accountable for developing innovation strategies for a diverse set of businesses and ensuring robust technology roadmaps and innovation pipelines to deliver growth and profit targets for 45% of the Clorox Company portfolio ($2.7bn in net customer sales). Among his businesses were Brita, Burt’s Bees, Glad, Hidden Valley Ranch, Fresh Step, and Kingsford Charcoal. Notable product platforms developed and launched under his leadership include Brita filter-as-you-pour, Burt’s Bees Natural Cosmetics, Glad Force Flex Plus and Force Flex Plus Advanced Protection (dual layer technology), and Fresh Step Clean Paws. In addition to his passion for developing leaders, Reza is passionate about workplace equality and is the Vice-Chair of the Board of Out & Equal Workplace Advocates, the world’s premier nonprofit promoting LGBT+ workplace equality. He and his husband James enjoy travel and hiking. Reza received his BSc.(Eng.) in Chemical Engineering from Imperial College, University of London, and his MSCEP in Chemical Engineering Practice and Ph.D. in Chemical Engineering from MIT. Professor Schindall re-joined the MIT faculty in June of 2002 after a 35-year career in the defense, aerospace, and telecommunications industries. His research includes the invention and development of a nanotube-enhanced ultracapacitor which holds the promise of being superior to electrochemical batteries as a means of efficient regenerative electrical energy storage, and he has also supervised research on dynamic simulation and reliability analysis of complex safety-critical systems. He has co-developed and taught a required senior course in communication skills, including units on conceptual thinking, giving presentations, how to be effective in industry, cross-cultural skills, and engineering ethics, and he is developing a course on engineering design. As co-director of the Bernard M. Gordon-MIT Engineering Leadership Program, Dr. Schindall is actively engaged in a program to enhance, expand, focus, and disseminate the teaching of engineering design and leadership within the MIT School of Engineering. Prior to joining MIT, Schindall was VP and Chief Technology Officer of Loral Space and Communications (a manufacturer and operator of commercial satellites), Sr. VP and Chief Engineer for Globalstar (a 48 satellite LEO mobile phone system), and President of Loral Conic (a manufacturer of telemetry systems for missiles and satellites). Dr. Schindall received his B.S., M.S., and Ph.D. degrees in Electrical Engineering from MIT in 1963, 1964, and 1967. During his graduate years he was lecturer and wrote the text for a 140 student introductory electronics course, received an award for excellence in teaching, and was chief engineer for WBCN, a commercial FM radio station. 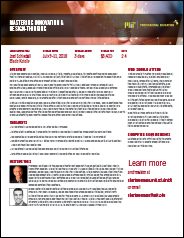 Gordon Engineering Leadership Program’s "Engineering Innovation and Design" course - MIT Open CourseWare (OCW). The OCW material includes lecture notes as well as video commentary by the instructors.